Summer is the season of festivals and KC has quite the plethora of fun fests to go to. Last weekend you had Boulevardia and this past weekend was the 5th Annual Maker Faire hosted by Make magazine. This being my first year going to the Maker Faire, I had no idea what to expect, only making me more excited for I found there. 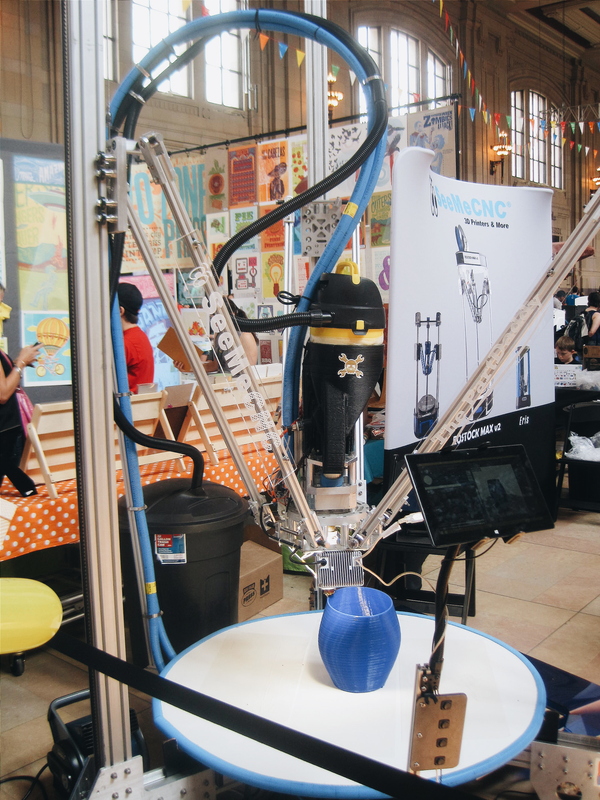 The maker faire is held in many cities around the United States but each city hosts their own local makers. And maker here is used in the general sense. The maker faire hosts makers of all kinds; farmers, engineers, wood workers, metal workers, etc. Brent’s favorite part of the fair was all the science and technology tables set up throughout Union Station and I have to admit, it was kind of fun listening to him tell me how everything I didn’t understand worked. Obviously, being a make up nut, my favorite part of the Maker Faire were all the home good vendors. But, beyond my home good heaven, the Faire hosted a myriad of 3-D printers, each boasting their own unique designs. The age of in-home 3-D rendering is clearly upon us and with the cost of the 3-D printer slowly becoming more affordable, why wouldn’t people want to see how they can create their own designs and become their own makers. There were many small printers that cod render small bowls or key chains and then there was a massive 3-D printer that was several feet tall that had the ability to render a functional chair. My only regrets, not sitting in the chair and taking a picture of it. But I did get a picture of the printer rendering a large planter vase. Also a crowd pleaser for children and adults alike, were the many costumes that were dawned and presented around Union Station. 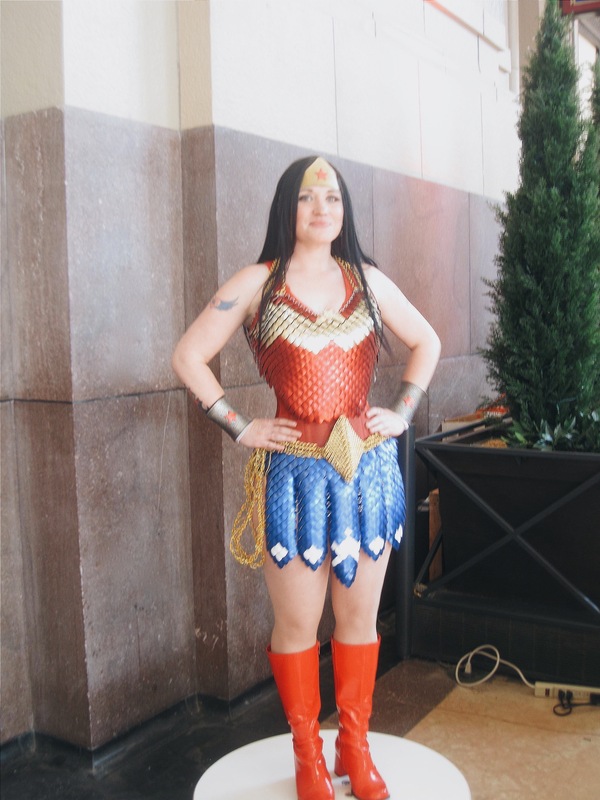 Check out Wonder Woman. Her costume was completely rafted from chainmaille. If any of you out there are familiar with how chainmaille works or how long it takes, you can admire the skill and patience it took to make such a costume. Not to mention the other costume replicas that could be found towards the back of the Station lobby. Having only made something out of chainmaille once—it was a bracelet—I can say it is very time-consuming, requires a lot of dexterity but the final product is very rewarding. Another popular sight was various Star Wars characters in honor of the upcoming film, The Force Awakens. If Brent wasn’t having a hay-day before, he certainly was when he saw someone dressed as a clone trooper—I originally called him a storm trooper but Brent very hastily corrected me and threw a look of disgust at my lack of Star Wars knowledge. He was so enamored with the costume that he asked me to take a picture of him and the man in the costume and quickly forbade me from posting the picture because he felt like a nerd. 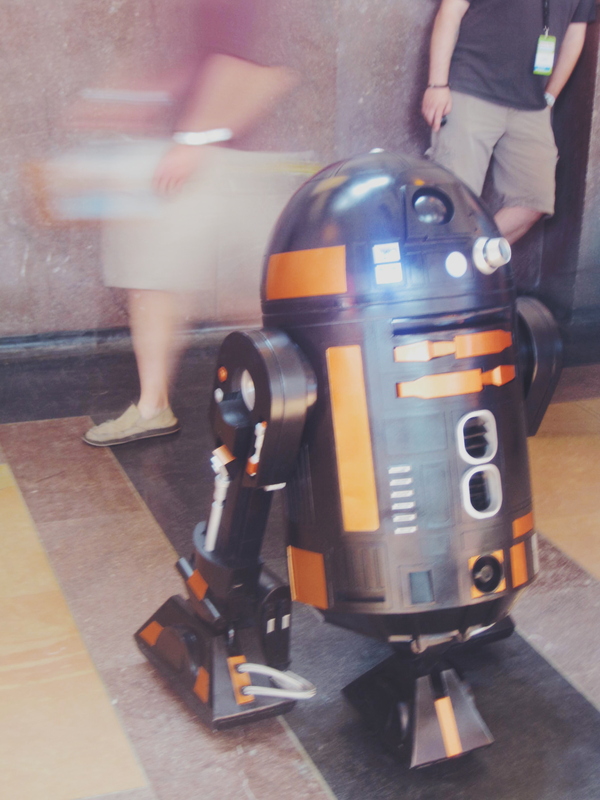 Equally cool were the R2-D2 replicas that were roving around the faire with its controller not too far away. One R2 model could even be found with his cohort, C-3PO. Last but certainly not least on the list of things to see were the classic and custom cars. Lined up facing the Liberty Memorial and shined to perfection, it was obvious that these cars were for display only. And there weren’t just classic cars out there, there was a tricked out Escalade fit for 50-cent—you know, back when he was sporting an Escalade in almost all of his music videos. But the climax of the vehicular display was the low-rider contest. Not only were these cars decked out in custom paint, they were also gearing up to be the highest “jumping” low-rider at the faire. The car below wasn’t even the vehicle that jumped the highest. After a long day out in the sun and discovering some cool gadgets and meeting some interesting people, Brent and I decided to call it a day. My first annual Maker Faire holds a special place in my heart because it has a little something for everyone to enjoy and the opportunity to round out my interests was a good change of pace. If you want to know more about the KC Maker Faire, visit makerfairekc.com, there you can visit their blog and find out about makers at the event. They probably even post spoilers for the upcoming Maker Faire. 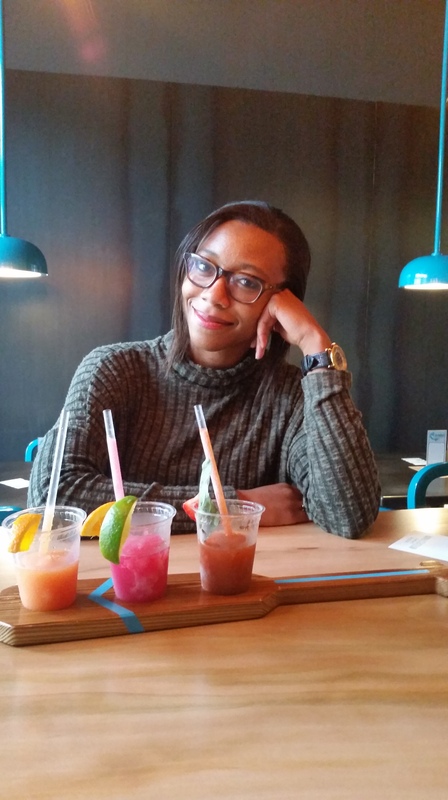 And, of course if you liked this post and want to read about all my other adventures around KC, subscribe and if you have a cool place for me to check out, leave it in the comments!